Those who know all the laws of Pesach are still required to ask questions at the Seder, and even a scholar dining alone at the Seder must ask questions. Why is that? The questions serve as an external pretext to refresh the memory, to raise our consciousness concerning the Exodus, even for those who know the story. At another level, someone who asks themselves questions and then answers them, can delve deeper and discover new aspects of knowledge and self-knowledge. 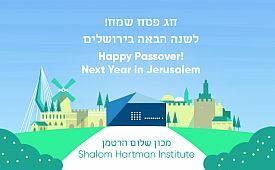 Barry Gelman: What Are We Celebrating On Pesach?